Let's eat our way through life! After a big hearty breakfast at Keys Restaurant, we weren’t hungry at all through most of the rest of the day. So, we took some time to explore a little bit of Saint Paul instead and found ourselves walking around the Mall of America for a couple of hours in the afternoon. In the early evening, we met up with my husband’s sister and her husband and decided to go out and catch a bite to eat. Earlier in the day, my sister-in-law told her brother that it was our choice where we would go for dinner, so after some searching online, my husband suggested to me a Thai restaurant in the neighborhood that got pretty good reviews. The minute he mentioned the name of the restaurant, I instantly recognized it as it’s a place I’ve heard my sister-in-law talk about and I know that she and her husband enjoy, so we decided that Thai food was what was on the menu for dinner. 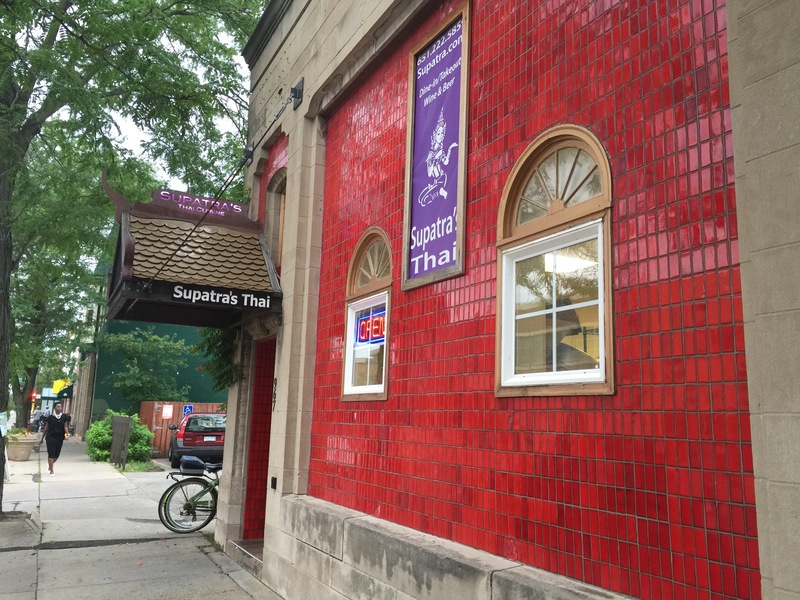 Supatra’s Thai is a local Saint Paul restaurant owned by chef Supatra Johnson who is also the author of a Thai cook book in addition to teaching Thai cooking classes out of the restaurant’s kitchen. When we arrived on a Thursday night, the place was busy and almost every table was filled, not to mention the fact that the restaurant obviously did a good take out business. This was a good sign and my husband and I were really looking forward to this meal. The inside was light and bright and the walls were adorned with tasteful Thai artwork and design. There’s no way my husband and I can go to a Thai restaurant and not order Thai iced coffee to drink. 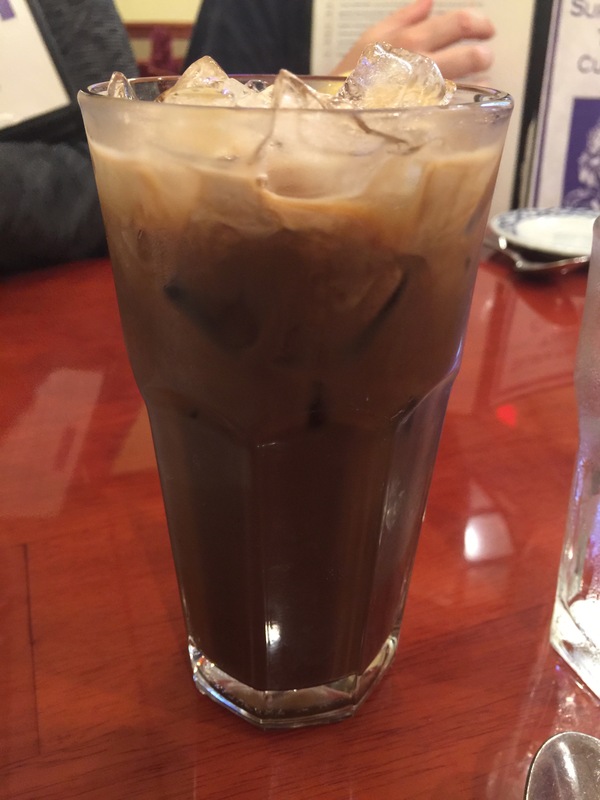 I know most people go to Thai restaurants and the drink of choice is Thai iced tea, but neither my husband nor I are a fan of Thai iced tea, but put a glass of Thai iced coffee in front of us, and neither of us would turn it down. The wonderful sweet, and strong flavor of Thai iced coffee is just so refreshing. The ultra strong brewed coffee mixed with half & half gives it that lighter, sweeter taste that is just so addictive. We decided to start off by ordering a variety of different appetizers for the table. I really wanted to try the tofu puffs, and though I think my brother-in-law thought it was kind of weird, he actually gave one a try as well when it came to the table. 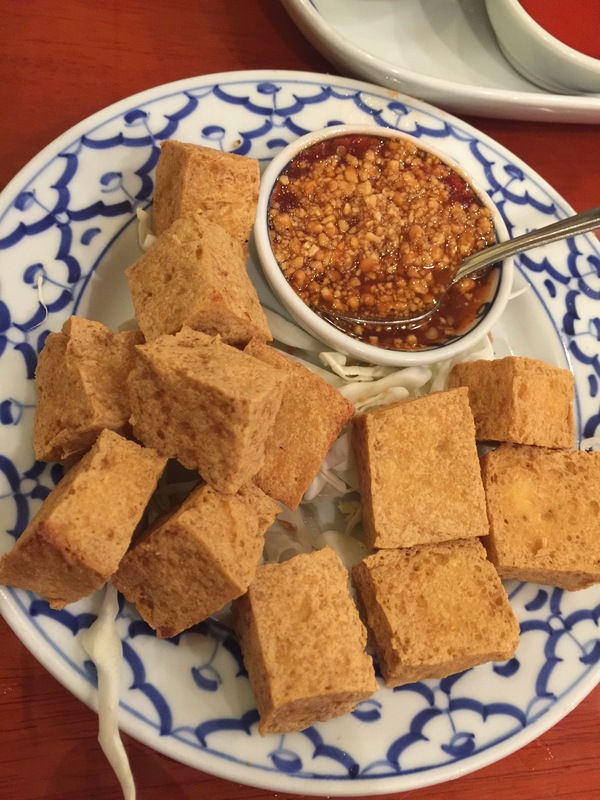 Tofu puffs are made from firm tofu cubes that deep-fried and served with a sweet peanut sauce. As my husband as learned over the years, tofu on its own is pretty tasteless. It has texture, but doesn’t really have a flavor of its own, therefore, it’s the perfect item to infuse flavor in, for example, by putting it in soup where it can soak up the flavor of the broth. Or, deep frying tofu also gives it this incredibly light and airy texture, and in this case, the sweet peanut sauce is what gives the tofu puffs the flavor. The flavor of the sweet peanut sauce is really all you taste and the tofu is really just a vessel for serving the sauce. The tofu puffs were actually pretty good, and the crunch and crispiness of deep-frying the tofu adds to the texture and flavor of the overall dish. Coconut shrimp was also another dish we ordered. 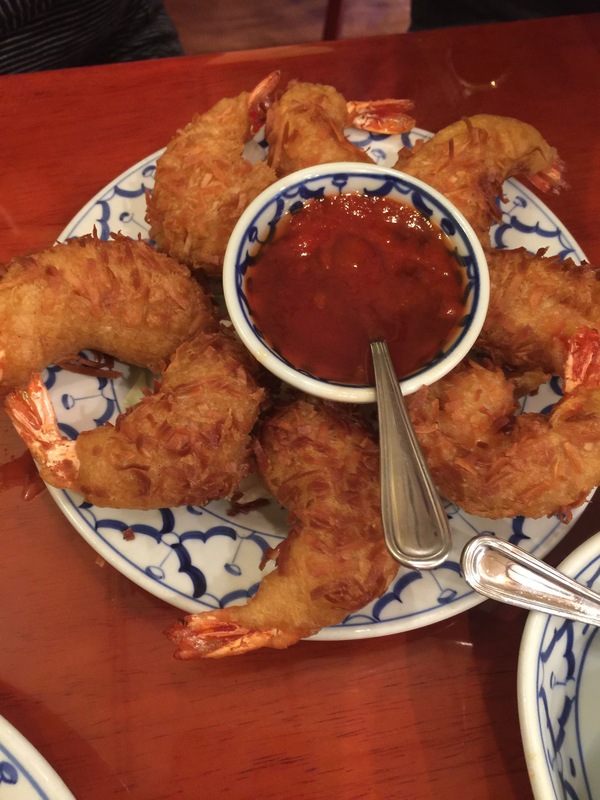 The shrimp is rolled in a sweet coconut tempura batter and deep-fried until golden brown. The coconut shrimp are then served with a sweet and sour sauce mixed with sriracha chili sauce to give it a bit of added heat and a little kick. The shrimp were a really nice size and so tasty and juicy. I really liked the coconut shrimp dish. The coconut tempura batter was delicious and crunchy without being too sweet from the coconut. The shrimp were perfectly cooked and tasted amazing. My husband and his sister and her husband really enjoyed the sweet and sour sauce with the sriracha chili sauce. For them, the dipping sauce had amazing flavor with just that little added heat to it. In fact, the sauce was so good they used it as the dipping sauce for some of the items in our next appetizer as well. Finally, we also ordered Supatra’s appetizer combo plate. 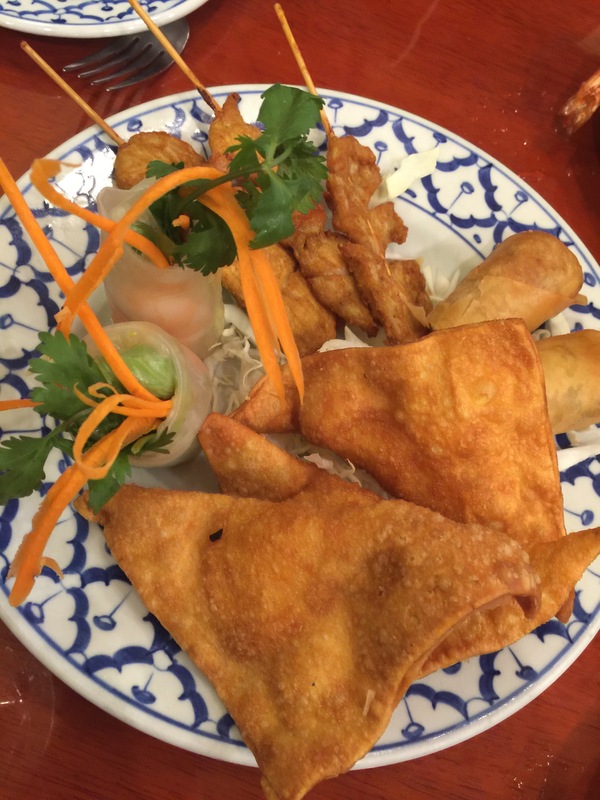 The combo plate comes with 1 Supatra’s egg roll, 1 fresh spring roll, 3 chicken satay skewers and 3 cream cheese wontons and each item had its own accompanying dipping sauce as well. The chicken satay skewers came with a peanut dipping sauce as well as a cucumber salad accompaniment. The peanut sauce was well done and had great flavor. The chicken skewers had a light charcoal flavor to them which was perfect and the cucumber salad was slightly sweet and slightly sour, just as it’s meant to be. I liked that there were both egg rolls and fresh spring rolls. The deep fried egg rolls came with a sweet and sour dipping sauce. The fresh spring rolls came with a chopped peanut chili sauce which was both sweet with a slight touch of heat. This was my favorite dipping sauce. The fresh spring rolls were perfectly prepared and filled with tons of fresh herbs and greens as well as a nice sweet shrimp. The egg rolls were nice and crispy and crunchy and perfectly deep fried. The cream cheese wonton is certainly a nod to east-west fusion as cream cheese is something that would never be found in Thailand. But wontons were perfectly fried to a nice crispy texture mixed with the creamy, soft cream cheese, which makes for a perfect juxtaposition. 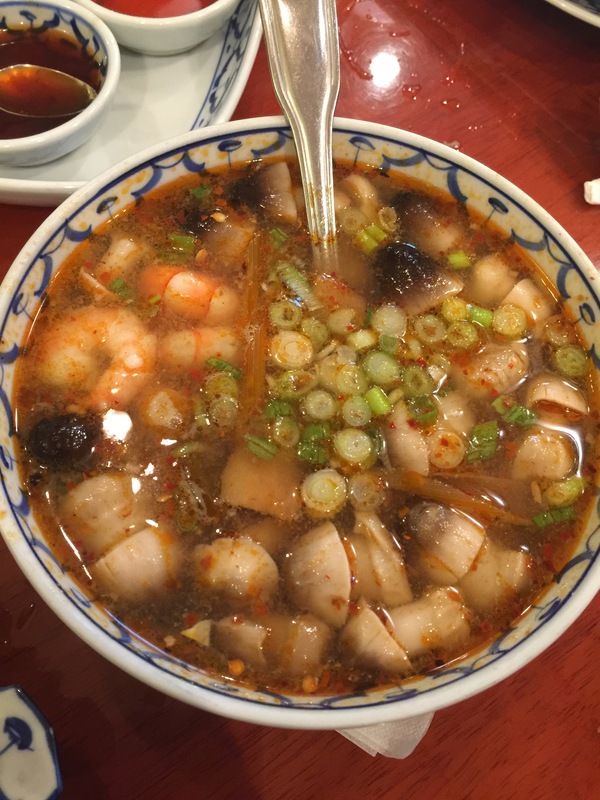 My husband wanted to order one of his favorite Thai dishes, tom yum soup. According to the menu, this is described as a famous Thai soup featuring lemongrass, galangal and lime leaves in a sour, spicy and sweet broth. Traditionally, tom yum soup is served with prawns or shrimp, but I’ve also seen it served with chicken before. But, my husband likes the shrimp version, and that’s what Supatra’s served as well, so he asked for a whole big bowl of the soup. The flavors were perfect, or at least the way we like it. At Supatra’s you can specify the level of spiciness that you want the dishes to be. In this case, since my husband knows that I don’t like spicy food at all, he asked for this to be mild. The soup itself is generally made to be quite spicy, so mild spice should be ok for me. It’s because the soup also has hints of sweetness and sourness that balance out the spice and make this soup as incredible as it is. It was so packed full of button mushrooms, which my husband likes. They are so flavorful because all of the flavors of the broth are soaked up into the mushrooms. The soup also had a good number of large prawns which were juicy and sweet. This was such a comforting soup dish on a cool evening. After looking through the menu, my sister-in-law and brother-in-law decided on two dishes that they’d share with one another. The first dish was called holy basil supreme. 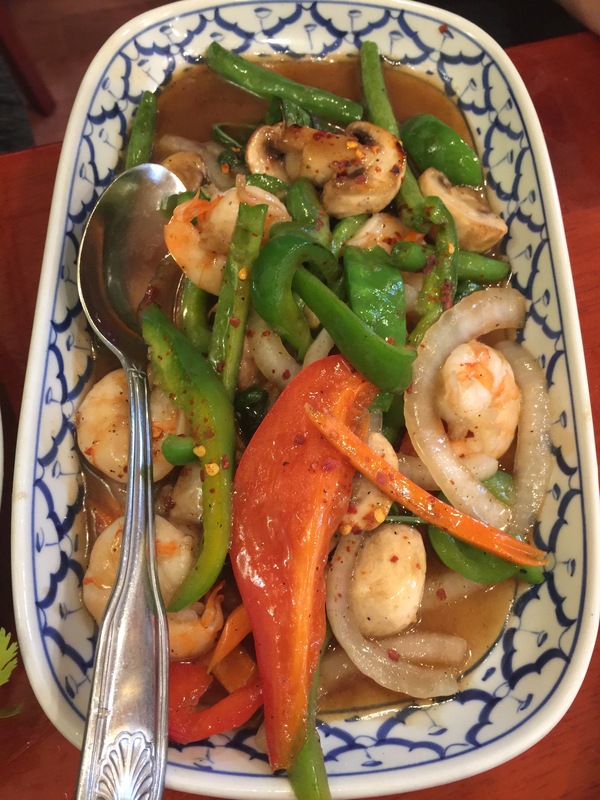 This was Supatra’s version of a very popular Thai dish which is a stir-fry with Thai holy basil, onions, bell peppers and mushrooms, serve with your choice of protein, for which they chose shrimp. Normally, in Thailand, this dish is made with ground chicken, most commonly, and generally doesn’t have the onions and bell peppers. But what makes the dish is the Thai basil, which this version at Supatra’s featured. It’s the Thai basil that gives this dish its distinct flavor. Again, the dish was packed full of prawns and bell peppers and was well more than one person could finish on their own. A little bit of steamed white rice to go with the dish, and again, a warm and flavorful Thai dish. One of the dishes that Supatra’s is well known for, and the name of the chef and owner’s cook book is her crying tiger dish. Crying tiger is a popular and classic northeast Thai dish made with tender beef sliced thin and grilled. At Supatra’s it’s served with wok-fried lettuce and Supatra’s special dipping sauce with a side of sticky rice. 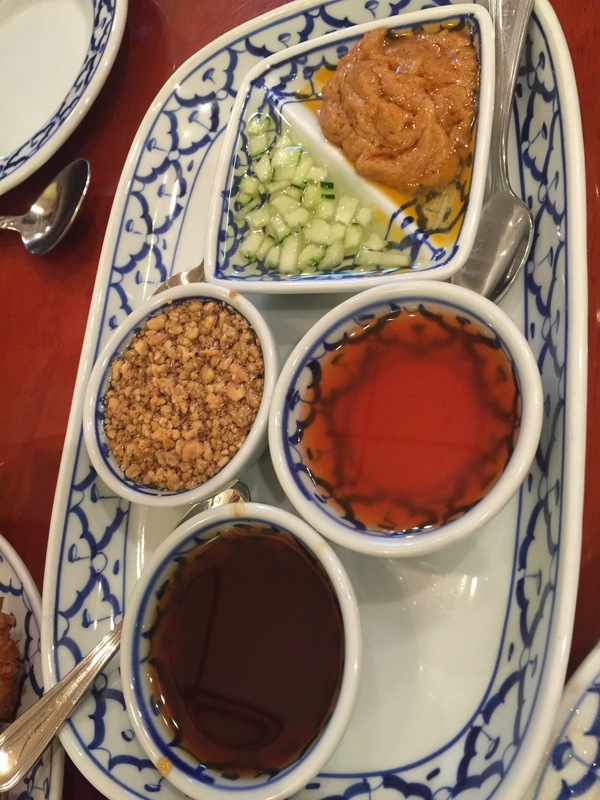 Like most Thai cooking the dipping sauce combines the flavors of sweet, sour and spicy so that every taste gives you a bit of all of the flavors rolled into one. The tender grilled beef dipped in the dipping sauce full of spice and sweet and a hint of sour eaten in combination with sticky rice is exactly what northeast Thai cuisine is all about, simple ingredients packed full of flavors that are as simple in their presentation and preparation as they are to enjoy. Sticky rice, in fact, is meant to be eaten with your fingers, it’s as much of a textural experience as it is a food experience for your tastebuds. The slight sweetness of the marinade on the tender beef is only heightened when the beef is grilled to perfection. The fresh lettuce salad and cilantro and other greens and herbs are there to add the cooling effect to the slightly spicy sauce and added crunch and freshness to a beef-rich dish. For my dish, I decided to order the goy see mee, which was described as Supatra’s Thai style chow mien featuring thin egg noodles that are cooked two ways; half are stir fried with vegetables and sauce and the rest are deep-fried to give a crunchy texture to this delightful unique dish with shrimp. Something about crispy, crunchy noodles just sounded so appealing. 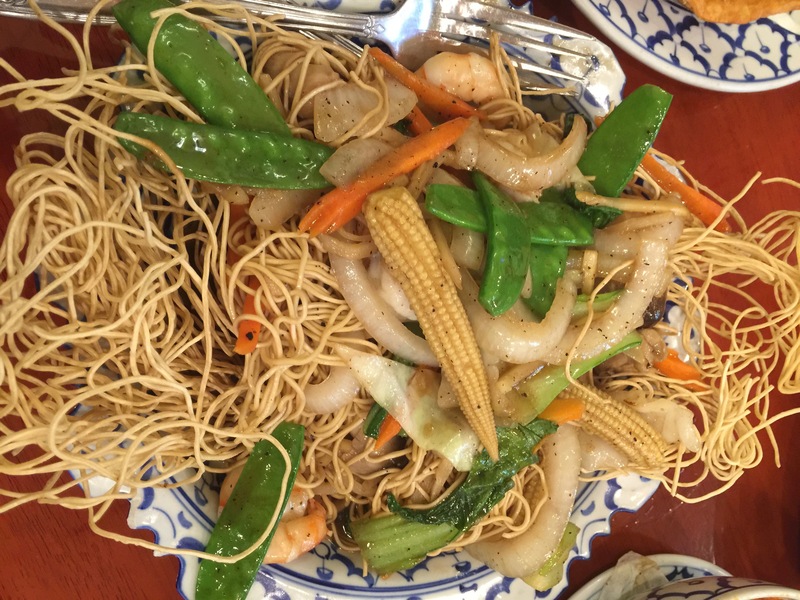 It’s very similar to a dish my parents used to make at home using glass noodles instead of egg noodles, but deep-frying noodles and then pouring over a stir fry with gravy over the noodles just creates such a comforting creation of crispy noodles contrasted with delicious and flavorful vegetables and sauce. In this case, the vegetables included baby corn, snow peas, julienned carrots, green onions and celery. Combine the vegetables with the wonderful shrimp and gravy sauce and it was out of this world. Using this sauce over egg noodles that are stir fried are incredible as the noodles soak up all the delicious gravy, but pouring them over deep-fried egg noodles are even better as it the crispy noodles are just amazing, they add flavor, but more importantly texture. And because they are deep-fried they are able to stand up to the gravy and don’t become soggy immediately upon having the stir-fried vegetables poured atop them. This was just fantastic. It’s such an easy dish to make at home, and yet so delicious and comforting. I’m so glad my husband suggesting dining at Supatra’s Thai for dinner, and I’m glad that my sister-in-law agreed to it. Dinner was a great time for the four of us to just catch up and do so while dining on delicious, filling food. 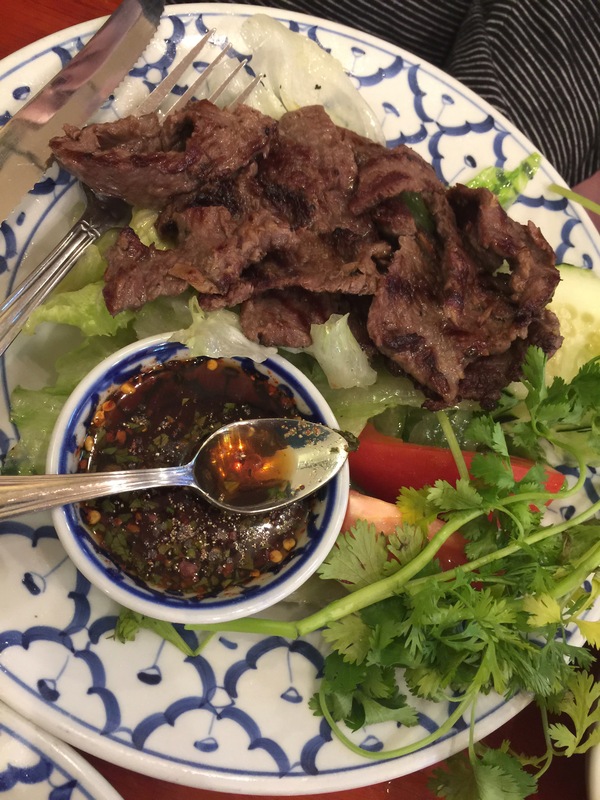 Everything we ordered at Supatra’s Thai was flavorful and all of us enjoyed it, it was so easy to see why the restaurant was not only busy, but so highly rated as well. This is the type of restaurant that my husband and I could see ourselves becoming regulars at, if only the restaurant was located near us in Southern California. Follow me as we eat our way around the world! What have I been eating lately?